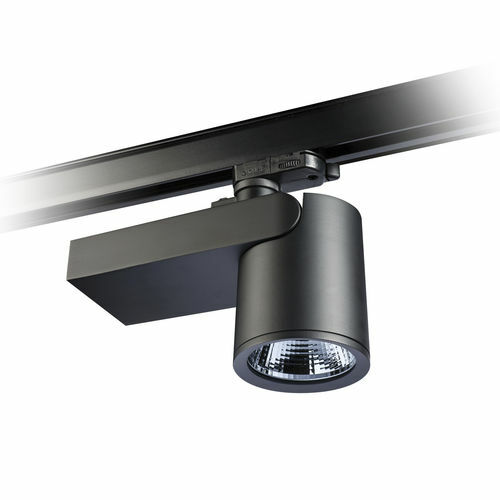 LED track light / round / cast aluminum / polycarbonate - STORE PROJECTOR - Targetti Sankey S.p.a. Lighting > Architectural lighting > LED track light > Targetti Sankey S.p.a.
STORE PROJECTOR Targetti Sankey S.p.a.
Professional projector for LED sources. Optical chamber and power box in painted die-cast aluminium. Front ring for accessories in painted aluminium. Available in black and white. Optical chamber adjustable 0° - 90° vertically and 355° horizontally. High emission LED lamps sources with a colour temperature of 3000K or 4000K and a CRI of Ra 84 or Ra 97. Convex faceted precision optics in high specularity metallised polycarbonate. “Scratch Proof Formula” treatment. Available in Spot, Flood, Medium Wide Flood or Wide Flood versions. A full range of optical accessories available. Integrated power supply available in the basic electronic or DALI version.